The path begins with an investigation of the unreliability of things. Sometimes when we contemplate impermanence and the unreliability of things we feel afraid or insecure. Question: In my mind my primary deity, Guru Rinpoche, is the only reliable refuge. Is there any difference between Guru Rinpoche and the outer refuge you describe in your talks? Thank you so much for your talks I found them empowering in many ways. Response: Thank you for your question Danny. I’m trying to recall how I spoke about outer refuge…and I can’t remember. But maybe I can take this opportunity to talk about refuge and we can look at different ways we do take refuge and how it does or does not support us. I will try to address your question. It seems to me that we all take refuge in our attempt to find a resting place…a place of ease…something we can trust. In an ordinary way we often take refuge in relationships, in our work, in our beliefs about how we think things are, in material wealth and so on. But because the nature of things is that they change, we often experience a lot of heartbreak. This is why the path begins with an investigation of the unreliability of things. Sometimes when we contemplate impermanence and the unreliability of things we feel afraid or insecure. But there is nothing more scary than relying on something that is not dependable. So to begin understanding refuge we need to look at our ordinary ways of taking refuge and how it doesn’t serve us. When we free ourselves from the fantasy that we can find ease in worldly things, we naturally begin looking deeper. The Buddha suggested we look into the causes and conditions for happiness and suffering. It is noble and reasonable to want happiness…but if we just follow our impulses rather than deeply investigating these causes and conditions, our actions won’t meet our intention for happiness. It is all quite practical…if it were not practical, what would be the purpose of following a path? So when we start to question cause and effect we ask: what happens when we practice patience vs. aggression, generosity vs. selfishness, compassion vs. fear? When we practice compassion or patience we observe freedom in the mind. Freedom from discord and fear is a sense of wellbeing and clarity…a place of ease. This is what we want. So finding this kind of freedom, wellbeing and refuge is really the purpose of the dharma. So we can use the Buddha (as an example) the dharma (as a path) and the sangha (as our companions on the path) as a support of refuge. I am in the middle of reading a very touching and profound book by Fleet Maull called “Dharma in Hell.” He talks about practicing the dharma in prison. He says that in prison he decided to take some Buddhist precepts, not because they were morally ‘right’ but because he had to find a way to support his mind not to fall into the darkness and confusion of the prison environment. One of those vows was to engage in what is called, “right livelihood.” In other words, he decided not participate in the smuggling and black marketing that goes on in prison. He got involved in hospice work and was there for the passing of many prisoners…In such a place where the odds are so against anything positive taking place, this man found creative ways to support his wakefulness. These positive supports are refuges. There are infinite ways to support wakefulness. Extending loving-kindness to others supports our wakefulness. Structuring our lives in a wholesome way, supports wakefulness. Not acting out aggressively or blaming others, supports wakefulness…even recognizing the goodness in others supports wakefulness. Relying on these kinds of supports is taking ‘outer’ refuge in the Buddha, the dharma and the sangha. This has nothing to do with deification. Deification is looking toward something outward to save you and perpetuate your fantasies. Taking refuge in the Buddha, dharma and sangha is seeing how there is something we can rely upon to support an inner wellbeing. It is the alternative to relying upon our fantasy that the outer world can save us. In the 3rd series of teachings the Buddha gave (the third turning) we find an interesting explanation of the outer refuge that begins to move us to an even deeper way of seeing things. In a very famous text called “Uttaratantra Shastra”, rather than speaking about the Buddha as an external being or historical person, it describes the Buddha as: that which is inseparable from our own true nature – the mind that is completely blossomed and clear of defilements.” Then it describes the dharma as the mind of natural intelligence. This is an intelligence we all posses…but it is obscured by ignorance. According to the text, the dharma of realization (not the dharma of letters) is the ultimate refuge. There is no higher refuge than the realization of the nature of things. The sangha refers to the unbroken line of realization. So we see in the later teachings of the Buddha how the refuge changes. 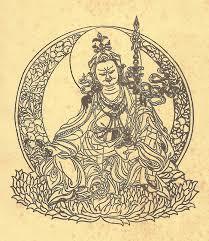 This text is said to bridge the notion of ‘outer’ refuge with the Vajrayana refuge. It is seeing the ‘inner’ aspect of refuge. The objects of refuge are not personified but rather seen as qualities innate in all beings. Now in the tradition of the Vajrayana we practice deity yoga. So for instance, we take on a support like, Guru Rinpoche, and develop a relationship. When I think of GR, I think of him as completely awake and fearless…just based on the qualities I read about him and what I understand from practicing his sadhana. But this fearlessness and wakefulness is not separate from our own nature. We can recognize it more and more in ourselves as we practice. So the relationship with the teacher or deity is meant to connect us to a way of being that goes far beyond ourselves or the teacher as a person. It seems like people approach this relationship in different ways. In a place like Tibet it is just natural to love Guru Rinpoche. In modern cultures people often question whether the Guru is real or unreal…or worry about blind faith. But in Tibet to simply say his name or mantra, to simply honor his qualities is the support or skillful means for awakening. I have spent a lot of time in Tibetan culture and I can see elderly people who just recite his name…and they have this incredible sparkle in their eyes…and you see they are not afraid to die. You see they are so open and beautiful…and that everything is simple for them. I know a lot of modern people have trouble with this approach. To adapt this foreign image and then just chant the mantra can feel quite artificial for them. I really understand this too. I am also a Western practitioner. So, it is important to look deeper into the nature of this relationship. It challenges a lot of our cultural concepts. But if we are willing to try it, it can be really powerful and amazing to open up into such a world. So in short, I suppose the difference between the outer refuge (which is seeing the Buddha as the historical Buddha), the dharma (which often refers to the dharma of letters\texts) and the sangha (our community) and the practice of guru yoga (for example taking refuge in GR) is that in the Vajrayana there is more emphasis on seeing the qualities of the guru as inseparable from the nature of our own mind. 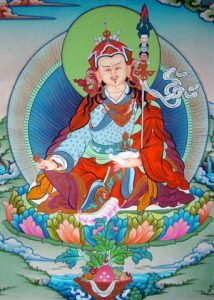 I suppose if we see Guru Rinpoche as a person, that is also an outer refuge. If we see him as the embodiment of our own nature, then he is the ‘inner’ guru. It seems like both can be powerful. For example, when we are studying a text (the dharma of letters), it can really give us a great deal of confidence and clarity. In this way we can take refuge in\trust the information the text imparts…but ultimately, the greatest dharma (as it says in the Uttaratantra) is the dharma of realization.